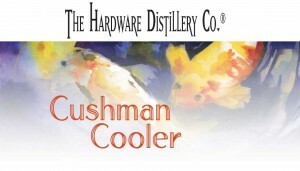 The Hardware Distillery’s Cushman Cooler is a hybrid of a Cape Cod, or “Cape Codder,” and a Madras. The Cape Cod is also made with vodka and cranberry juice, but is usually garnished with a lime wedge. The Cape Cod was conceived in 1945 by the Ocean Spray cranberry grower’s cooperative under the name “Red Devil.” A Madras includes orange juice, rather than the Cushman Cooler’s orange peel garnish and seltzer water.